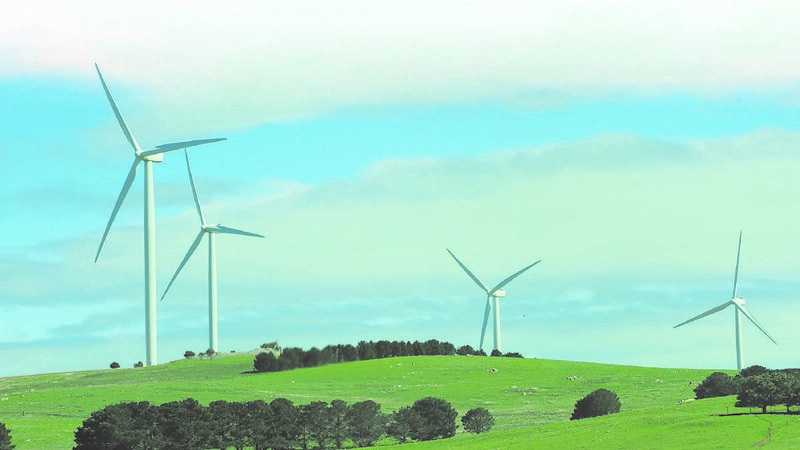 THE Shire of Coorow is welcoming of the State Government’s announcement that it has given the go-ahead for construction to begin at the 180-megawatt Warradarge Wind Farm, near Eneabba. The Warradarge Wind Farm has been recognised as one of the best renewable energy projects in Australia due to its location and abundant wind resource, according to Energy Minister Bill Johnston. Its 51 turbines will be among the largest in WA with a tip height of 152 metres, sporting some of the longest blades onshore at 66 metres. Coorow Shire president Moira Girando, Marchagee, said any investment into the region was welcome especially if it would create local jobs and boost tourism. Ms Girando said the Shire had a declining population and she hoped that the renewable energy industry could create more employment in the area to help control that. She said the Shire has a “long term (10 year) plan” to install solar panels on “all council run buildings”, staging it so as not to be a burden on ratepayers. In the announcement made before Christmas, Mr Johnston said the Warradarge Wind Farm project would be funded and developed by Bright Energy Investments (BEI) – a partnership between Synergy and the private sector launched by the State Government in April. Mr Johnston said the sustainable energy solutions company Vestas, which claims “more than 17 per cent of the global installed base” from wind farms, has been awarded the engineering, procurement and construction, as well as operations and maintenance contracts. “I’m delighted to announce the construction of the Warradarge Wind Farm will be going ahead and will create up to 200 jobs for Western Australians,” Mr Johnston said. “The wind farm will have a total output of 180 megawatts with a 50pc capacity factor – the equivalent of the average annual electricity needs of 135,000 WA homes. “The State Government remains committed to ensuring a transition to a renewable energy future at the lowest cost possible to WA taxpayers. Western Power will construct the 10-kilometre transmission line from the wind farm sub-station to the network connection point near Eneabba. Other BEI projects include the Albany Grasmere Wind Farm and Greenough River Solar Farm near Geraldton. Vestas Asia Pacific president Clive Turton said he was “extremely pleased to work with BEI on this project”. “It has extraordinary wind conditions and will make an important contribution to powering WA with competitive renewable energy,” Mr Turton said. BEI general manager Tom Frood was confident that the Warradarge Wind Farm would be delivered “smoothly and on-schedule”. “Synergy has a strong history in WA solar and wind assets, and is committed to increasing its renewable energy portfolio, and Vestas’ rich industry expertise and proven track record will ensure that the first power generation is on track for 2020,” Mr Frood said. Commercial operations at Warradarge Wind Farm are scheduled to commence in the third quarter of 2020. The specifics announcement by the State Government were somewhat different to the details in the Urbis Planning Compliance Report 2012. The report however said that “the proposed Warradarge Wind Farm will result in minimal onsite modification to the existing rural landform and minimal modification to vegetation in the Rural zone” in the Shire of Coorow. 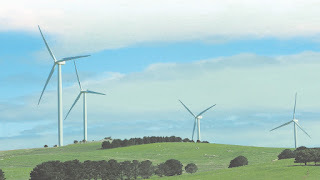 “Whilst it is acknowledged that the Wind Farm will be visible from surrounding local and regional locations, these views are limited as a consequence of the distance of the site from developed areas such as Coorow, Leeman, Greenhead, Eneabba and Carnamah,” it said. The State government has given the go-ahead for construction to begin at the 180-megawatt Warradarge Wind Farm, near Eneabba. The project will be funded and developed by Bright Energy Investments (BEI) - a partnership between Synergy and the private sector launched by the McGowan Government in April. World-renowned sustainable energy solutions company Vestas has been awarded the engineering, procurement and construction; and operations and maintenance contracts. The Warradarge Wind Farm is recognised as one of the best renewable energy projects in Australia due to its location and abundant wind resource. Its 51 turbines will be among the largest in Western Australia with a tip height of 152 metres, sporting some of the longest blades onshore at 66m. Energy Minister Bill Johnston predicted the construction of the wind farm would create up to 200 jobs for Western Australians. “The wind farm will have a total output of 180 megawatts with a 50 per cent capacity factor - the equivalent of the average annual electricity needs of 135,000 Western Australian homes,” Mr Johnston said. PROPOSAL To consider a development application for an extractive industry (gravel) on Lot 3 Rowes Road, Yathroo (the Site). BACKGROUND The proposal is to be situated in the north-western portion of the property, which is approximately 26km south-south-east from the Dandaragan town-site, and 11km north-east from Regans Ford. The property comprises a total area of 1039.23ha and is accessed via Rowes Rd to the north and Gillingarra Rd to the south. The Site is part of a broad-acre farming property owned and managed by the proponent for livestock grazing and cropping. The Site contains an existing shallow gravel pit of approximately 2.9ha in area that has been used on an irregular basis for gravel extraction by the Shire for road-making materials. The proposal intends to increase this pit to approximately 46.6ha. It is envisaged the gravel would be used as foundation material for further roadmaking and in other infrastructure projects in the locality such as the wind farms. The proponent intends to enter into a commercial arrangement with a suitably experienced civil construction company / extractive industry operator to further develop the gravel resource, rather than undertake gravel extraction directly. The Site is zoned Rural under Local Planning Scheme No. 7 (LPS7), where such a land use is “A”; meaning it is not permitted unless the local government has exercised its discretion by granting development approval after giving special notice in accordance with Clause 64 of the Deemed Provisions of LPS7. • rehabilitation of the land consistent with its long-term future use. The Environmental Protection Authority’s Guidance Statement No.3 - Separation Distances between Industrial and Sensitive Land Uses (GS3) is referenced by the fact sheet for a generic, non-definite buffer distance of extractive industries. GS3 is intended to provide an approach to minimise the land use conflict between industry, including rural industries and surrounding sensitive land uses. These buffer distances are not a substitute for taking all necessary measures to contain impacts on-site. GS3 provides a buffer distance of 300-500m between extractive industries and sensitive land uses, depending on the size of the operation, as buffer distances are influenced by: site characteristics; the proposed location of infrastructure; access routes; pits and stockpiles; and the extraction method. both reinforce the above by the listing like matters to be addressed in assessment of applications for extractive industries. COMMENT The Site is surrounded by other Rural zoned properties, with the nearest residence (currently unoccupied) located 850m west from the property boundary and 950m from the proposed pit. This complies with GS3’s recommended buffer distance of 500m from sensitive land uses. The next adjacent residence is located approximately 2.3km northwest. The proposal will also be visually screened by vegetation from the Rowes Road access point, with 350m being the nearest distance the pit is to be located away from the entry. The proposal is subject to comply to with the Environmental Protection (Noise) Regulations 1997 at all times. The extractive industry is not considered to operate at noises above these regulations given: there will be no blasting activities; operations will only operate during normal daytime business hours, Monday to Saturday; only modern low noise operating machinery will be used; and the proposal complies with the recommended buffer distance. 1. Disturbance of topsoil - this poses the major risk of dust generation given the finer particle size within topsoil. To minimise such generation this activity will be confined to the wetter months, April to October, when the topsoil material would be less likely to be transported by wind due to its moisture content. 3. Transport of gravel - with the offsite transport route being sealed, dust is easily managed in this activity by sufficiently covering truckloads with tarpaulins. The proponent will ensure internal access ways are maintained to a sufficient compact surface level to limit transport dust generation within the Site.  There is no apparent water runoff/flooding risk of the pit given the well-drained permeable, low gradient and predominantly gravelly soils contained within.  There is no risk of stream sedimentation or other adverse impacts of extraction activities on natural drainage systems due to the significant distance to the nearest watercourses (9km to Moore River and 14km to Caren Brook).  The site is sufficiently elevated above the water-table to avoid any possibility of evacuation adversely affecting groundwater systems.  No acid sulfate soil conditions occur within the property and the physiography and geology are not conducive to the presence of such. In terms of biosecurity, the Department of Primary Industries and Regional Development after consultation has recommended the applicant submits a Weed Management Plan to ensure minimal biosecurity risk for the landowner and the adjoining farms along the transport route. This will be required as a condition of development approval. Traffic management is a concern of the proposed development. The Site access and egress would be via Rowes Road, linking onto Dandaragan Road. These access roads proposed are suitable for the volume of traffic and type of heavy vehicles. This route, between Brand Highway and the entrance to the property is 16km in length, all of which is sealed and in good condition, except for approximately 275m of slip road at the access bend to Rowes Road. This slip road access to the property shown in the picture below is of concern, Shire officers have sought advice from Main Roads WA – Wheatbelt Regional Office regarding the following issues:  The entry/exit point is on a sweeping 90 degree bend on Rowes Road.  Vegetation limits sight distance for drivers entering Rowes Road.  With the above in mind, there are concerns that the proposed increased number of heavy vehicles entering and existing site onto Rowes Road may not be able to do so in a safe manner. To mitigate these traffic issues the applicant has proposed to install appropriate hazard advice signage and remove some roadside vegetation to improve sightlines. Main Roads WA have indicated that the preferred method to improve safety at the intersection could be the installation of a T junction intersection to Rowes Road to be constructed as detailed in the green aerial image overlay below. This would be similar to the intersection with Rowes Road and Bidgerabbie Road some 9km north of the proposed site, which was installed by the Shire through Blackspot Funding due to similar road safety issues. These issues need to be discussed further with Main Roads WA, Shire officers and the proponent to clarify exact conditions of approval prior to operations commencing. This may include the proponent having to undertake a road safe audit and concept design for an approved site access with Rowes Road at the cost of the proponent. The entrance gate will be appropriately secured and signposted for access from authorised persons only and warning of “Heavy Vehicles in Operation” and “Evacuation in Process”. Site visitors will be required to contact loader drivers by CB Radio or the site manager by mobile, and report to the site office. Internally the access is track is an unsealed all weather surface, which as mentioned previously, the proponent will ensure is maintained year round through its contractual arrangements with a third party operator. The proponent notes the predicted number and size of trucks accessing the site will fluctuate with demand for gravel. If the site is successful in winning the future tender to supply the construction of the wind farms, it is anticipated for an approximate six month period that the Site will have an estimated 30 trucks per day with loads varying from 12 to 48 tonnes. After this period the demand is predicted to fall, with only 2-4 trucks predicted to be realised per day. To ensure sustainable road maintenance upkeep of the proponent’s transport route a condition of approval will ensure a fee of 50cents per estimated tonne transported offsite is paid to the Shire annually. The final consideration of the development is rehabilitation post gravel extraction. A condition of approval will ensure the site is restored to its current broadarce farming use. To reinforce this, the proponent will be required to submit a bond/guarantee or other acceptable form of security to the Shire to be held in trust until rehabilitation is undertaken to the Shire’s satisfaction. To assist in rehabilitation the proponent will stockpile topsoil for respreading and levelling during this final process. Shrubs and trees endemic to the area are also proposed to be scatter planted over the Site. Provided the above, it is considered the proposed use is consistent with the intent of the Rural zone given it enables an ancillary rural activity to co-exist with the predominant broadacre use of the land in a manner that will not impact on the rural character and amenity of the area. Furthermore, given gravel extraction is a temporary use, the land can continue to be used for broadacre farming once the extractive industry operation has ceased. Therefore, the extractive industry application is recommended for approval subject to conditions. Submissions and officer responses to such are detailed in the attached Schedule of Submissions. FINANCIAL IMPLICATIONS The applicant has paid the required planning application fee of $739.00. If Council approves the development application, the applicant will be required to pay a further $500.00 for an extractive industry licence, with an annual licence renewal fee of $300.00, given the pit is greater than the 5ha fee threshold. As discussed previously, the applicant will be required as a condition of the licence to pay the Shire an annual road maintenance contribution fee of 50 cents per tonne transport off site. Given this fee is not listed in the Shire of Dandaragan’s 2018/2019 fee and charges the fee will be advertised for a period of 35 days in accordance with Section 6.19 of the Local Government Act 1995. 1. All development shall be in accordance with the attached approved plans and specifications dated 27 September 2018 subject to any modifications required as a consequence of any conditions of this approval. The endorsed plans shall not be modified or altered without the prior written approval of the Shire. 2. Hours of operation shall be limited to 6.30am to 5:30pm Monday to Saturday. 3. No extraction activities are to operate on Sunday and Public Holidays. 4. Maximum depth of excavation shall be to an average of 2.5m below natural ground level. 5. Topsoil from the excavated areas shall be stockpiled and used where applicable in the rehabilitation process. 6. No sales by wholesale or retail shall be undertaken from the site. 7. All vehicles’ loads entering and exiting the site shall be fully covered and secured prior to and upon leaving the site to prevent spread of material. d) 40 metres of any watercourse. 9. Any storage of fuels or refuelling on site is to be located on a designated hardstand area location to the satisfaction of the Shire. 10. Any fuel leakages or spills are to be cleaned up within 24 hours. 11. The development must comply with the Environmental Protection (Noise) Regulations 1997 at all times. 12. Prior to the commencement of development, the proponent must submit and have approved by the Shire a Weed Management Plan. 13. Prior to the commencement of development, the proponent must undertake further discussions with the Shire and Main Roads WA to develop and implement an approved traffic management plan, for when truck >5 per day for site access with Rowes Road. 14. A report detailing excavation activities and tonnages of material transported from the Extractive Industry site for the financial year period ending 30th June is to be submitted to the Shire by 31st July each year. 15. The licensee shall pay an annual road maintenance contribution for the lifetime of the operation of $0.50 per estimated tonnage of material transported off-site. This fee will be advertised for a period of 35 days in accordance with section 6.19 of the Local Government Act 1995 prior to being charged. 16. Payment of the road maintenance contribution shall be made in advance, with the first payment due upon the commencement of operations. Thereafter, payment may be made on a quarterly basis. Advance payments made through the year shall be reconciled against the actual activities and additional payments shall be sought or credited as appropriate. a) Prior to the commencement of development a guarantee/bond or other acceptable form of security shall be lodged with or paid to the Shire for a sum of $10,000. To be returned to the licensee upon successful rehabilitation of the site, to the satisfaction of the Shire. b) Upon decommissioning of the evacuation area, rehabilitation shall take place in accordance with the approved plan, or as otherwise stipulated. c) Any amendments or variations to the rehabilitation shall be approved in writing by the Shire within three months of the commencement of such operations. d) Materials imported for rehabilitation or other purposes shall be certified free of dieback or other plant diseases. 1. This approval is valid for a period of two (2) years. If the development has not substantially commenced within this period the approval will lapse and be of no further affect. a) Category 12: Licensing is required if the material is screened, washed, crushed, ground, milled, sized or separated and more than 50,000 tonnes is processed per annum. b) Category 70: Registration is required if the material is screened, washed, crushed, ground, milled, sized or separated and more than 500 tonnes per annum but less than 50,000 tonnes per annum is processed. into two lots of approximately 1668.8ha and 270.2ha respectively. environmental findings of the site. potential impact on groundwater quality. drainage which is particularly vulnerable to the use of fertilizers. impact on the environmental values of the area. mining and recreational activities does not degrade the area. so as to safeguard the environmental values of the area. intensive agriculture will be carefully assessed. of water pollution, noise, dust, odour and possible soil erosion. substitute for taking all necessary measures to contain impacts onsite. impinge on their quality of lifestyle. time and seasonal workers working on the property. · Cervantes and Munbinea Roads are sealed roads and provide good access to the site. there is sufficient power available to the site. dust generation with the potential for off-site impact. floodwaters may transport nutrients from manure into wetlands. boundaries, waterways and water bodies. appropriate buffers and fringing vegetation defined. · Soil and Water Management Plan. · Stormwater Management Manual for Western Australia. quality and quantity of bore water to service the industry. located away from both these land characteristics. · There is no wider potential for land use conflict from things such as spray drift or smoke between existing and proposed use. · The use will not sterilise land with potential for urban expansion or other long term land needs as there is unlikely to be any urban expansion in the vicinity. · There are no sensitive adjoining land uses. · The proposed development will form a uniform group with AAA Egg Company’s first site located approximately 2km northwest at Lot 25 Munbinea Road. · The development should not significantly detract from any scenic landscape and/or conservation attributes identified in the locality as the proposal is approximately 11km from Indian Ocean Drive. · Tronox request that the proximity of valuable mineral resources and possible future mining activities be communicated to the proponent. · As there are no existing dwellings or other sensitive land uses within 1000m of the site the application complies with both local and State buffer distance standards. · Further to Table 7 from the Shire’s Local Rural Planning Strategy illustrated above the Department of Primary Industries and Regional Development (DPIRD) have advised that there is a required minimum distance of 1000m required between any other poultry farm sheds. The proposed poultry farm complies with this requirement as the poultry farm will be located approximately 2km from the proponent’s other operating poultry farm in the Hill River region. between Industrial and Sensitive Land Uses. adverse impacts on nearby residents. minimize the effects of stable flies on the community. · 120m3 of manure is produced weekly. weeks creating 60tons of carcasses (11.43tons weekly). · General waste is approximately 2 to 3m3 per month. the level known by the farm managers to cause odour. offsite for further processing, reuse or disposal. global leaders in poultry housing systems. Guidelines for Poultry currently being reviewed. ongoing improvement via review and action methodologies. training and verification of our QA system. found in the attached documentation). · There are no local policy implications relevant to this item. including the approved Environmental Management Plan. (Free Range Poultry Farm) only. commenced within 3 years of the date of this approval. Australian Egg Industry (June 2008). 5. The maximum number of laying hens shall be 360,000.
be borne by the proponent. wastewater, waste products or reflected light. Guidelines for the Australian Egg Industry (June 2008). environment by and at the cost to the proponent. Health prior to issuing a Building Licence. effects of stable flies on the community. poultry to an increased risk of disease. property boundaries, waterways and water bodies.